Partial dentures are used if one or more of your natural teeth continue to live in your upper or lower jaw. Like complete dentures partial dentures are removable. Partial dentures, also known as “partials,” are used when a person is missing some but not all of their natural teeth. They can also be used when the remaining organic teeth aren’t strong enough to support a bridge or other dental devices. Partial dentures are fit onto the neighbouring natural teeth with clasps. They are removable for easy cleaning and are created to look like organic teeth. 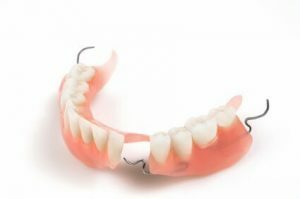 How do I know if I need partial dentures? When we visit your for the initial consultation we will examine your mouth thoroughly. Generally, if your remaining natural teeth have not been removed and remain strong, you will need partial dentures instead of complete dentures which are used when all the natural teeth are gone. Because partial dentures are used to replace some missing teeth, if you have not lost all your teeth, they will be the right choice for your mouth. A great benefit of partial dentures is they fill the spaces created by missing teeth but also keep other teeth from changing position. Your oral health is important, especially as you age. Your partial dentures need to be removed and cleaned daily to ensure that they remain free of bacteria. Plaque and tartar can build up on your dentures and create problems like stains, bad breath or worse, gum disease. Partial dentures that are not well-maintained can also cause problems for your remaining natural teeth such as cavities and tooth decay. If you are not able to care for your dentures, your caregiver can clean them on your behalf. As part of our services, we offer professional cleaning and whitening of your dentures and relines, repairs and adjustments. Partial dentures take some getting used to but after a while you will be amazed at how restored your mouth function is and how dazzling your smile has become. For more information about partial dentures or to make an appointment, contact us today. We are the the only mobile denture clinic in Calgary and we are here to give you your smile back.